We are the leading manufacturer of Flexible Tailpipe. 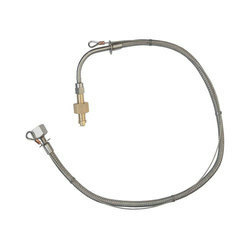 Manifold system is connected to the gas cylinder through the flexible tailpipe called pigtail. It is made up of Teflon tubing (inside) and exterior ss wire braided with flexible protection. The end connectors are suitably designed to fit on the gas cylinder, a regulator as well as manifold systems.